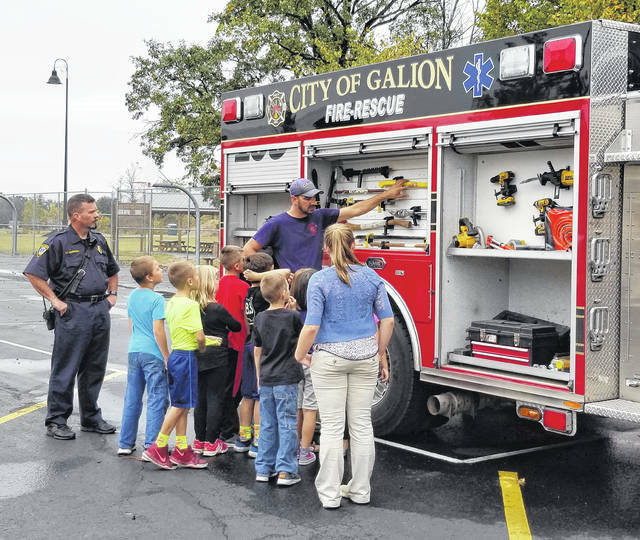 GALION — The Galion Fire and EMS Department is visiting local schools and preschools this week as part of Fire Prevention Week. Students get to talk to firefighters and take an up-close look at a fire truck and ambulance, as well as all the equipment used by the department. They also go through the Smoke Trailer, a mobile learning unit in which kids learn fire dangers to watch for and how to safely get out of a house in the event of a fire. Practice a fire drill twice per year (one at night and one during the day). Practice using different ways out of the home and teach children how to escape on their own. Once you get outside, stay outside. Jackson also reminds residents in Galion and Polk Township that free, reflective house signs are available. These signs make it easier for the safety forces to identify addresses, especially at night. To request a sign, fill out a form or call the Galion Fire and EMS Department at 419-468-5580. Courtesy photo Lt. Jay Gaffney (left) and firefighter/paramedic Lamar Newswanger explain the equipment stored on a fire truck at Galion Primary School. https://www.galioninquirer.com/wp-content/uploads/sites/38/2017/10/web1_1.jpgCourtesy photo Lt. Jay Gaffney (left) and firefighter/paramedic Lamar Newswanger explain the equipment stored on a fire truck at Galion Primary School.